What is Servicetrace Robotic Solutions? Servicetrace Robotic Solutions is a powerful application performance management platform that enables businesses to deliver premium, business-critical IT services. The software monitors the performance and availability of business applications from an end-user perspective at multiple locations spread across the globe. It operates without any restriction on all graphical user interface (GUI) which means it can be used on all proprietary and existing applications. This is an ideal solution for insurance companies, IT service providers, global outsources, and manufacturing industries. The platform is founded upon a “virtual user” concept and leverages a self-deployed, patented technology to objectively measure performance, availability, and functionality. Its design means it can be deployed in the production environment as well as the test environment. Servicetrace Robotic Solutions ascertains the quality of every application through numerous tests which include system integration test, functional software test, regression tests, and load tests. Servicetrace Robotic Solutions suite for application performance monitoring, robotic process automation, and test automation aims to optimize the quality of business applications, prevent errors to reduce IT costs, and accelerate troubleshooting and error analysis. It facilitates service operation by streamlining synthetic, transaction-centric, end-to-end application performance management and expedites automation of day-to-day operations to unlock potential and save resources. The platform is secure and can run stably even when application drop-outs or pop-ups arise. It’s also easy to use and requires little to no programming experience since the end-user simulations are automatically organized as graphics workflows. One of its powerful modules is the robotic process automation suite. This module provides tools that enable businesses to save time on the tedious, repetitive, and error-prone routine processes. It performs the recurring processes allowing your employees to concentrate on multi-faceted projects and tasks that unlock opportunities for your business allowing you to compete on the global scale. Better still, the suite promises enhanced resource utilization with inimitable, rapid RPA implementation. The application performance monitoring module is another highlight for Servicetrace Robotic Solutions. The suite enables businesses to meet a consistently high-quality of application for customers and employees alike. It monitors application performance and availability from the end-user perspective at locations worldwide. In addition, this functionality provides alert when the stipulated thresholds are exceeded and reports on the quality of service being delivered. 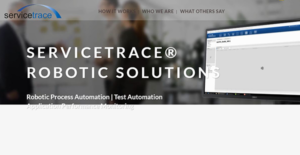 The Servicetrace Robotic Solutions test automation module provides extensive testing to every application before going live. It saves resource by eliminating the need to utilize the error-prone and time-consuming manual testing. The tool ensures that even when upgrades or other changes occur there will be no operational or functional glitches or even system downtime. If you are considering Servicetrace Robotic Solutions it might also be sensible to analyze other subcategories of Best Application Performance Monitoring Software gathered in our base of SaaS software reviews. Each enterprise has different wants and needs a system that can be customized for their size, kind of staff members and customers, and the particular industry they are in. For these reasons, no platform can proffer perfect tools off-the-shelf. When you look for a software app, first be sure what you want it for. Read some Servicetrace Robotic Solutions reviews and ask yourself do you desire basic tools or do you want sophisticated functionality? Are there any industry-specific features that you are looking for? Obtain the answers to these questions to help your search. There are lots of aspects that you need to mull over and these include your finances, specific business wants, your organization size, integration needs etc. Take your time, try out a few free trials, and finally choose the system that presents all that you need to boost your organization effectiveness and productivity. How Much Does Servicetrace Robotic Solutions Cost? We realize that when you make a decision to buy Application Performance Monitoring Software it’s important not only to see how experts evaluate it in their reviews, but also to find out if the real people and companies that buy it are actually satisfied with the product. That’s why we’ve created our behavior-based Customer Satisfaction Algorithm™ that gathers customer reviews, comments and Servicetrace Robotic Solutions reviews across a wide range of social media sites. The data is then presented in an easy to digest form showing how many people had positive and negative experience with Servicetrace Robotic Solutions. With that information at hand you should be equipped to make an informed buying decision that you won’t regret. What are Servicetrace Robotic Solutions pricing details? What integrations are available for Servicetrace Robotic Solutions? If you need more information about Servicetrace Robotic Solutions or you simply have a question let us know what you need and we’ll forward your request directly to the vendor.